Summary Expandable eight bay, high-performance BYOD SATA NAS with many features based on a dual-core Intel Atom D2700 processor. Synology recently tweaked its five (DS1512+) and eight (DS1812+) bay expandable small-biz NASes to create the DS1513+ and DS1813+, which are the subject of this review. 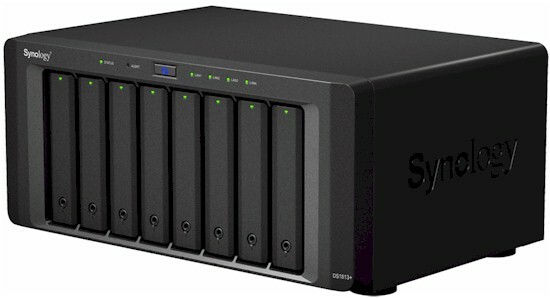 Actually, I'm primarily focusing on the eight-bay DS1813+ that Synology sent. But since the only difference between it and the DS1513+ is three fewer drive bays, most of this review applies to both products, particularly the Performance section. The 1813+ and 1812+ look essentially the same from the front. The 1813+' drive trays, which now hold the drives without screws have a beveled front surface. There are also four LAN status lights vs. the two on the 12+. The 13+' front and rear panel callout diagram below shows the four aggregatable Gigabit LAN ports, four USB 2.0 ports, two USB 3.0 ports and two eSATA ports. There are no front-mounted USB ports, which may be inconvenient for some. Note that there are neither VGA nor HDMI ports for display attachment. So if you want to log into the Linux console, you'll need to enable SSH or Telnet and come in that way. There also is no alpha-numeric status display to easily check the NAS' IP address. But if the NAS is on a network with an internet connection, typing find.synology.com will get you connected. Synology has designed the 13+ for easy serviceability. The fans are mounted on a panel so that they can be swapped out without having to open the case. Taking off the cover is easy and provides easy access to the built-in power supply. Swinging around to the left side, the board is in clear view with the expansion SODIMM slot easily accessible. If you have to take the main board out, it's easy too. QNAP should take some lessons from Synology here, since getting the main board free on most of their products involves virtually disassembling the entire unit. To prove how easy it was, here's the main board, out for its close-up. The key components for the DS1813+ and, for comparison, the DS1512+ reviewed last June are summarized in the table below. All the SATA controllers appear to be on the main board vs. mounted on the backplane like QNAP does. The NAS came with eight Western Digital WD RE4 2 TB (WD2003FYYS) drives, which drew 93 W with all drives spun up and 33 W when programmable drive power save kicked in. The 1813+ was surprisingly quiet for a NAS with eight drives, audible, but not annoying at all in my quiet home office with the NAS parked on a desk about two feet away.